The Darren Weir-trained Whispering Brook (l) has won the Group Two Australia Stakes at The Valley. In-form mare Whispering Brook has continued her unbeaten preparation, defeating a quality field in the Group Two Australia Stakes at The Valley. 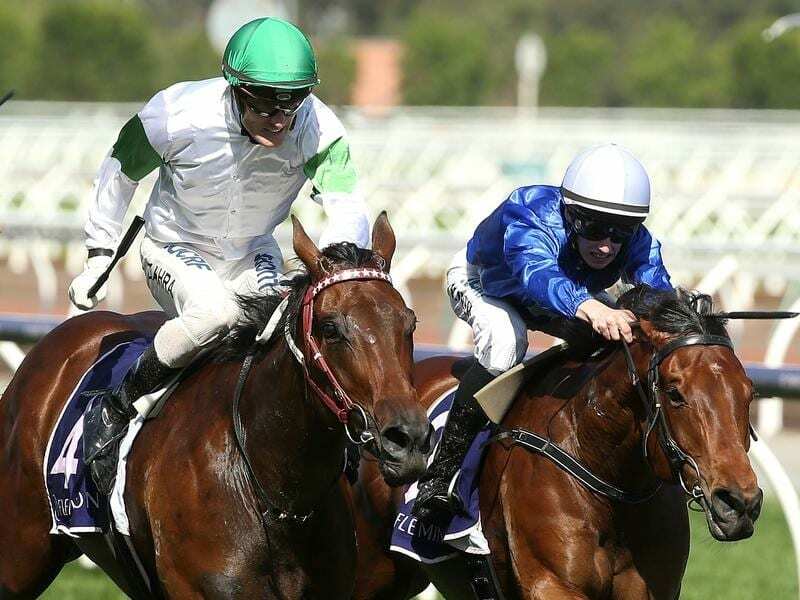 The Darren Weir-trained mare went into Friday night’s weight-for-age sprint off the back of two wins at Flemington this preparation, including the Group Three Standish Handicap at her most recent start. With Mark Zahra aboard, $3.20 favourite Whispering Brook settled behind leader Fell Swoop before getting into the clear on the outside of the Matt Dale-trained sprinter rounding the home turn. Whispering Brook edged clear of Fell Swoop ($9.50) in the straight to beat the multiple Group One placegetter by three-quarters of a length with Toorak Handicap winner Land Of Plenty ($6) doing his best work late to finish another 1-1/4-lengths away third. “Even coming to the gates I thought she just looked absolutely spot-on,” Zahra said. Whispering Brook took her record to 10 wins from 23 starts. “She’s having a great preparation,” Weir said. Weir indicated the Group One Sangster Stakes for fillies and mares in Adelaide would be a logical target in May but said before then the Group One C F Orr Stakes (1400m) would be considered.